Our Gesha Coffees from Finca San Jerónimo Miramar are now available! We are currently offering a Washed Process Gesha, and a Honey Process Gesha from this farm near Lake Atitlán, Guatemala. Ringing in at 37 bucks for a 12oz bag, this isn’t your run-of-the-mill coffee. Read on to discover with this coffee is so special. Gesha is the most prized cultivar in the specialty coffee world, selling for prices well above any other coffee. But what makes this highly-valued coffee so special? First things first: geisha or gesha? This varietal of coffee gets its name from its provenance in eastern Ethiopia, near the town of Gesha, where it is believed to have originated. But over time, as it made its way around the world, the name took on a new form and now both ways of spelling are widely used. When this cultivar’s seeds were introduced to Panama from a research station in Costa Rica, it was originally documented with the spelling Geisha. Thus, the spelling “Geisha” tends to be more common when the cultivar appears in Central and South America. Sign for Gesha/Geisha coffee plots at Finca San Jerónimo Miramar, Guatemala. This heirloom cultivar has traveled through Tanzania, Kenya, and Costa Rica, but only started to become famous after landing in Panama in the 1960s. In 2004, Gesha coffee arrived on the world stage by winning the top prize at the Best of Panama (BOP) competition. Since then, gesha has fetched the highest of coffee prices - often selling at over $100 per pound, and makes routine appearances at the high levels of brewing and barista competitions. Originally selected because of its resistance to certain forms of coffee leaf rust, or roya, this low-yielding plant is now prized for other characteristics in the cup. It is renowned for its quality, specifically relating to its sweetness, acidity, and floral tones. The gesha plant itself has some features that make it distinct and identifiable apart from other coffee trees. It has a tall stature, and is characterized by its elongated leaves, oval structure of the bean and the strong perfumed floral scent of the blossoms. Nossa Familia’s Director of Coffee, Rob Hoos, says that gesha is so popular in specialty coffee because “it has a flavor profile that fulfills the sought-after flavor profile for people who work in and are heavily engaged in specialty coffee: sweet, bright, tea-like, and floral.” Indeed, expert cuppers often describe the notes of gesha with a feast of the finest fruits, such as papaya, guava, citrus, berries, mango, and pineapple. Other common flavor notes include bergamot or Earl Grey, citrus peel, coffee cherry, honey, floral, and honeysuckle. The fifth-generation coffee farmer at Finca San Jeronimo Miramar, draws parallels between good coffee and other fine foods: “Finding differences amongst different, similar wines can be difficult for someone getting acquainted with the art. It’s the same with chocolate and coffee! Gesha is just like that bold difference in a special wine that makes it stand out, with the coincidence that it is just a super pleasant taste! A symphony of flowers, citrus acidity and sweetness.” He also notes that it is often a struggle for a farm to present itself to specialty roasters, and gesha cultivar helped open the door to the specialty realm for their farm. 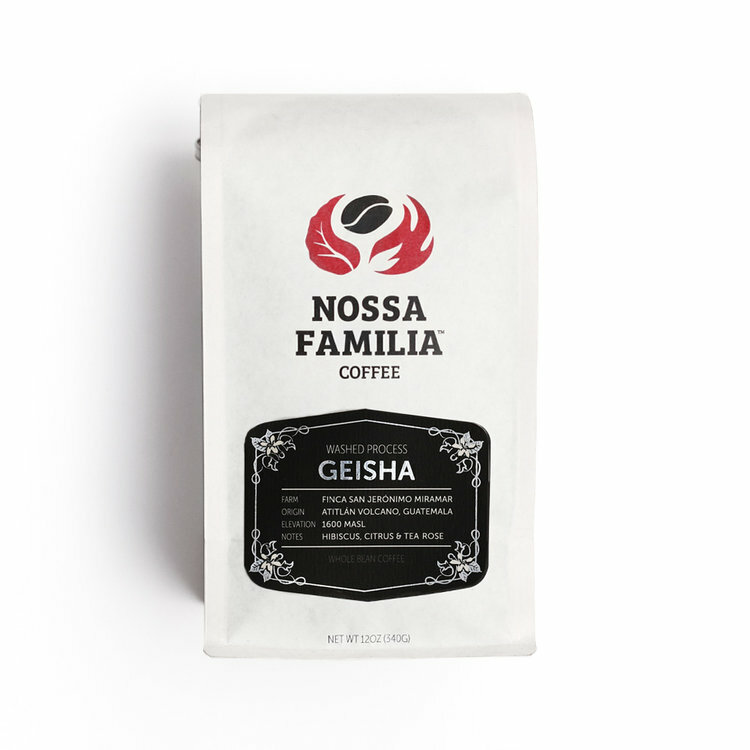 What’s the story behind Nossa Familia Coffee’s Gesha? At Nossa Familia, we have sold gesha coffees from both Colombia and Guatemala. This year, we are selling two different versions of the same gesha coffee plants: a washed process and honey process. >> Read up on the differences in coffee processing methods, washed vs. honey. This coffee comes from Finca San Jeronimo Miramar in the Atitlán region of Guatemala. The gesha seed was a gift to the farm from a world-famous coffee researcher who visited several times and was impressed by their good work. He gave the gesha seed to the farm administrator and told him to plant it on a special spot since it was a very special bean. They planted it high on the slopes of the Atitlán Volcano, at 1500 meters above sea level, on the El Ensayo lot, which means “Trial.” These magical beans helped the farm later on as an express ticket to the specialty coffee realm. The farm owner says they believe their gesha has a fuller body and sweeter finish than most geshas they have tried.